用戶評價: 此套膠旋轉和速度比國狂或省狂都優勝很多, 而且不用灌膠, 質量穩定, 持欠耐用, 令人欣喜! 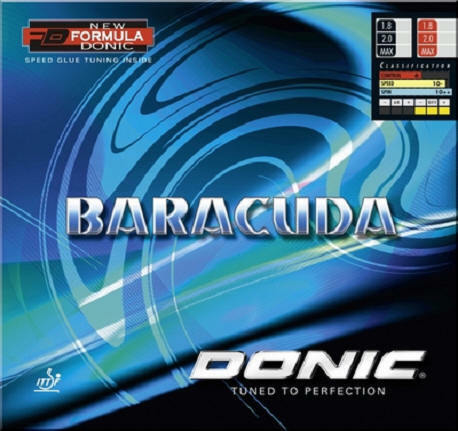 The new FORMULA DONIC BARACUDA rubber with inbuilt speed glue effect produces fantastic spin. With DONIC BARACUDA the ball leaves the blade in a conspicuously higher arc, giving considerably more spin. The increased rotation of the ball stabilises the flight and increases speed. The results are convincing after a few hours of training to become used to this modern rubber. Accuracy of placement is visibly improved even for top players. DONIC BARACUDA offers that extra margin of safety even in the tightest situation, and not only when engaged in a high risk top spin game. DONIC BARACUDA?s top rubber surface has been newly constructed to minimise abrasion and damage to the edges. The happy result: more playing hours with a surface that remains intact without noticeable damage.